Every time I see someone that I haven’t seen in a while they ask me, “How’s running going? How was your race?” Ugh… that is not the same thing!! It was great, thanks! Do you really want to know how it went? I’ve made the mistake of going into too much detail with non-runners only to be far too disappointed when they obviously don’t care or don’t actually understand. Not their fault, right? But it is so frustrating to have someone ask about something so personal, so emotional, so detailed, and reply, “It was great, thanks!” FAIL. Does it look like I liked it? It just isn’t that simple. Some people asked and I decided to give a simple, yet more honest answer: it was better than I expected, and it was really emotional. Emotional? Didn’t you go running!!? BAHHH… NVM. Don’t ask. 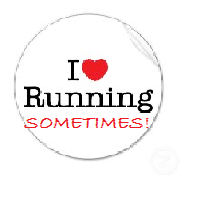 The truth is, my relationship with running is really complicated. 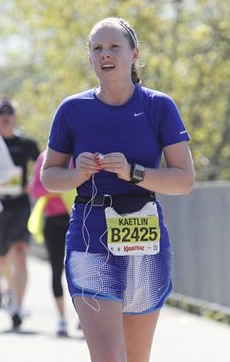 I started this blog when I was so obsessed with running and so excited to be a runner that I couldn’t find enough stuff to read, talk about, listen to, inhale, etc. about running. And my boyfriend wanted me to SHUT UP about running and blogs! Contrast that with this week when all I really have on my agenda now after graduating is my training plan for an upcoming race, and I am SO over it! I have gone out for midweek 9 milers two weeks in a row and turned them into 4 milers. I can’t find the passion. I am starting to get worried. I know my race next weekend will help. 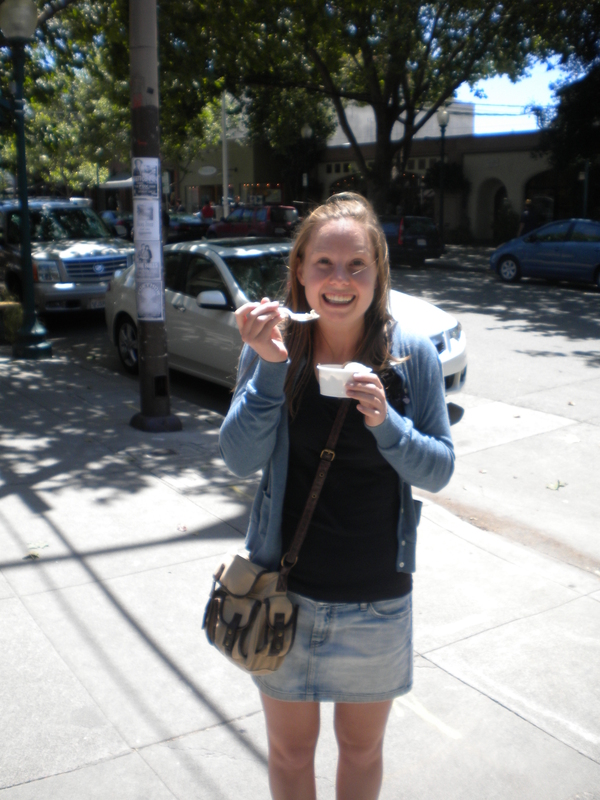 I know running with A.Jay when she moves back to Berkeley next week will help. I know going home and having a running group will help. But I need it now! 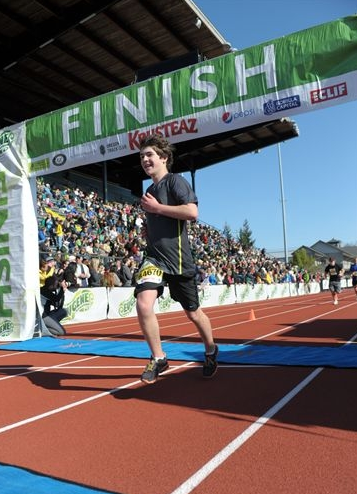 The Eugene Marathon was on May 1, 2010. It was my second full marathon, but really my first solid marathon attempt because I wasn’t injured and it was more than 26 degrees (Disney World 2010.) A ton of people were there to run it including my virtual running group, my brother, and some friends! 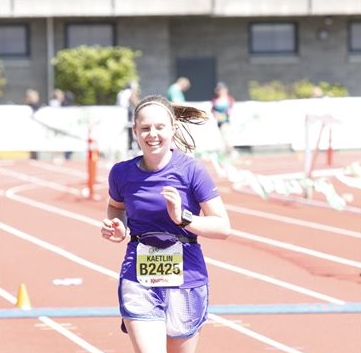 I didn’t know if it made sense to set a goal before the race because I was so unfamiliar with my body at that distance, but the day before the race I told my mom I would be ecstatic if my time was under 4:30. 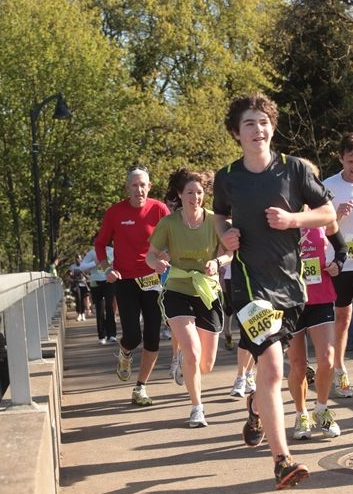 Here is the little bro running his half marathon! He ran with me until mile 5 when I decided to stop for my first gatorade. We were holding a good 8:30 pace except for the first crowded mile was about 10:30. He ended up matching his PR with a 1:53! I held a pretty consistent pace through the halfway mark, just around 8:30 while running, but I was stopping to eat sharkies and drink water and gatorade a bit. I came to the half just over 2 hours!! I was feeling pretty strong, but it got lonely REALLY FAST as soon as we turned off from the halfers, so I was struggling to stay entertained. At mile 16, I decided to stop at a bathroom because I had needed to pee since the very beginning. Well… I ended up waiting for over 5 minutes for the bathroom. I finally yelled to all of the people in the bathrooms that I needed to leave if they were going to be a while… boom! a lady comes out. Was she waiting for someone to yell at her? I don’t know, but my anxiety was high at that point. Miles 17 and 18 were GREAT and FAST! At mile 20 I was on track to finish in under 4:15. What!? Then I hit the biggest wall you have ever seen. Here is someone who didn’t hit the wall! The kid floated across the finish! Miles 20 through 26 are a blurr of angry feelings every time I looked at the Garmin, obsessive thoughts about water and sitting, and small cries for help every time I saw another person. My quads had huge knots sticking out of them. I HATED it. Then I finished in 4:22, still completely happy with my time. I leaned over right at the finish line and openly cried for a few minutes. I can’t describe how I was feeling. It was just plain emotional. So many feelings were flowing through me. There was overwhelming pride, joy, exhaustion, and even some disappointment after the last 6 miles. 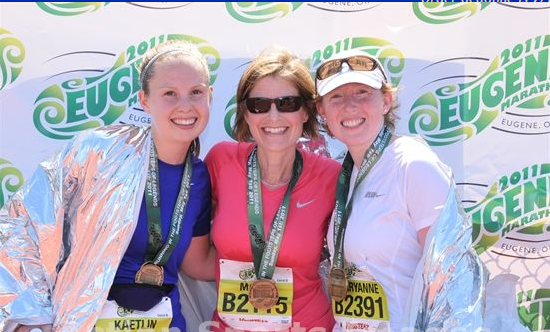 My mom, Maryanne, and Kym (the people I trained with in spirit on the same training plan) came in 15 minutes later with smiles all around. They kept an even pace the whole race, but still hated the last 6. I am so proud of them. The best thing about the race was knowing that I could have run a smarter race and avoided hitting the wall with better fuel and hydration. I almost immediately told my mom I wanted to sign up for the San Francisco full instead of the half! That’s always a good sign… wanting to do it again! !